CISMAs are local organizations that bring together landowners and land managers to coordinate action and share expertise and resources to manage invasive species. CISMAs often function under the authority of a mutually developed Memorandum of Understanding or Cooperative Agreement and are governed by a steering committee. Together, CISMA partners develop a comprehensive invasive species management plan for their area. 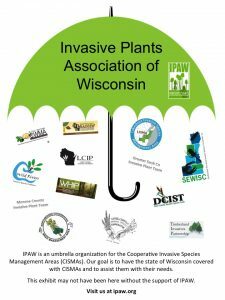 If you are a Wisconsin CISMA (listed below) and you would like financial help to be able to attend an invasive plant outreach and education event, IPAW would like to will give you up to $200 annually to pay for your vendor/booth space/IPAW co-sponsored or co-hosted event. Download our application for more information and to apply! The Midwest Invasive Plant Network’s (MIPN’s) Cooperative Weed Management Area resource page may also be of interest to you. Click a tab below for further information! A comprehensive plan that addresses the management of prevention of one or more noxious weeds or invasive plants. At the least, CISMA plans include invasive surveying and mapping components as well as plans for integrated invasive species management. More comprehensive plans may include education and training, early detection of new invaders, monitoring, re-vegetation and annual evaluation and adaptation of the invasive species management plan. Locally-driven CISMAs are especially effective at generating public interest in invasive species management and organizing community groups to support on-the-ground programs. In states that do not have a long history in or strong legislative mandate for invasive species management, newly forming CISMAs are building crucial grassroots support for statewide weed management programming. A Cooperative Invasive Species Management Area is a partnership of federal, state and local government agencies, tribes, individuals and various interested groups that manage noxious weeds or invasive plants in a defined area. Here is a list of CISMAs within the state of Wisconsin who are willing to help you out with your invasive plant needs. The map above shows you where they are located within the state. You can also browse an interactive map to see where these and other CISMAs are located. 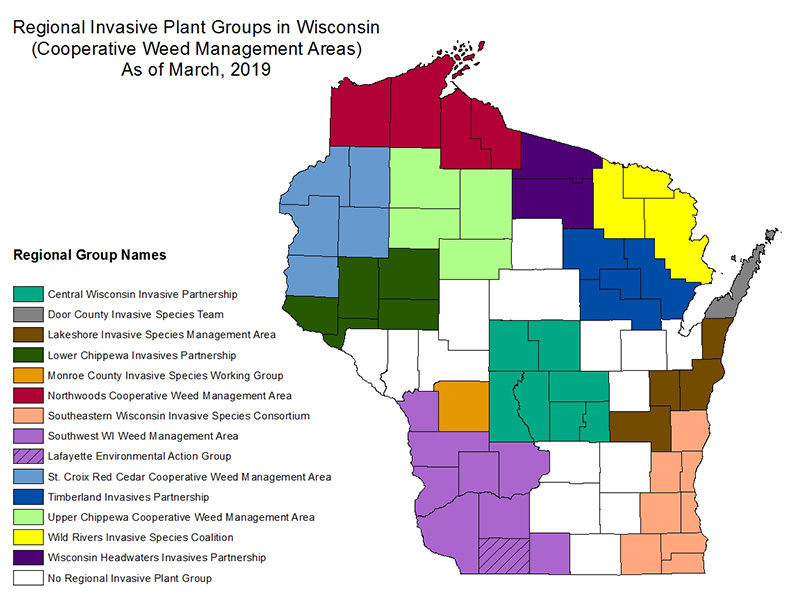 This is a listing of other regional and county groups and contacts for people working on invasive issues in different parts of Wisconsin. Most are not formal organizations, but groups of people working together on issues in their region. Some of them meet on a regular basis and have active projects, others are just getting started.